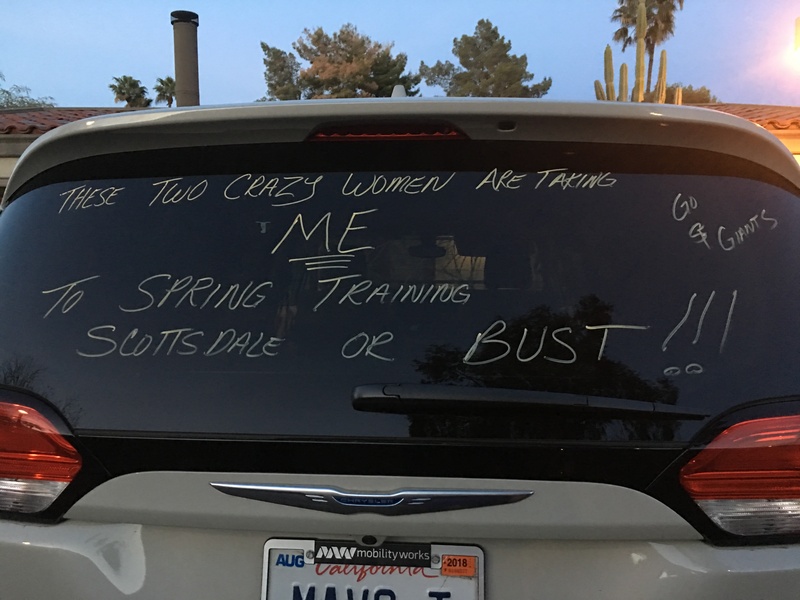 We’ve returned from our great spring training trip! 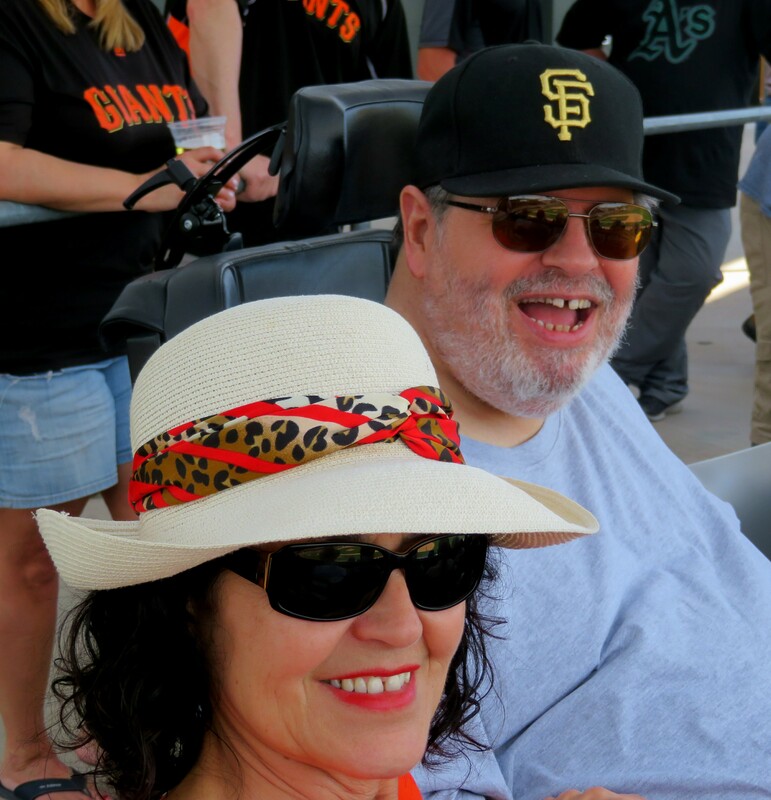 It was our first trip to Spring Training for ten years due to my disabilities. 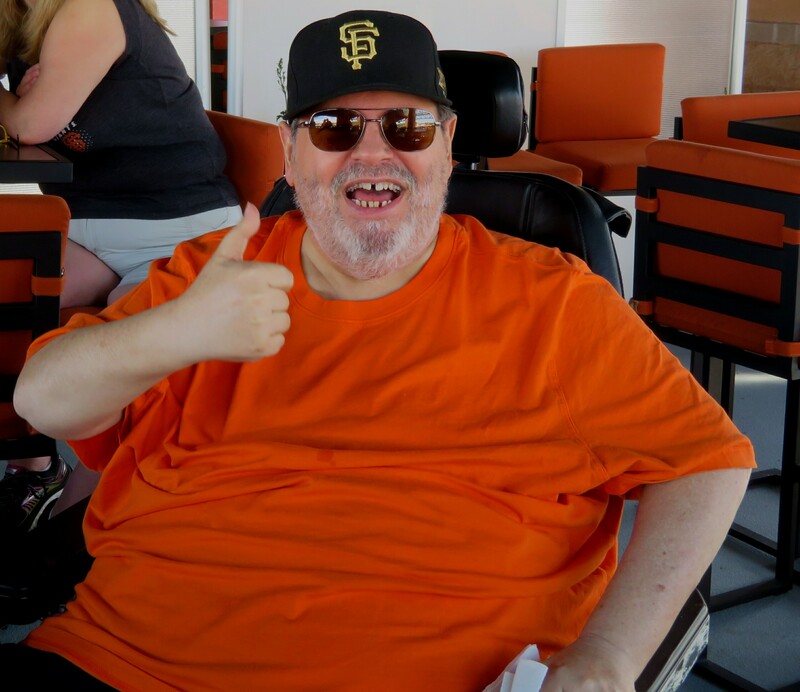 Being in Arizona in March to watch the Giants prepare for the long season ahead is one of the best experiences a baseball fan can have. Before I describe the highlights of our trip I must pay tribute to the two beautiful women that made my trip possible. 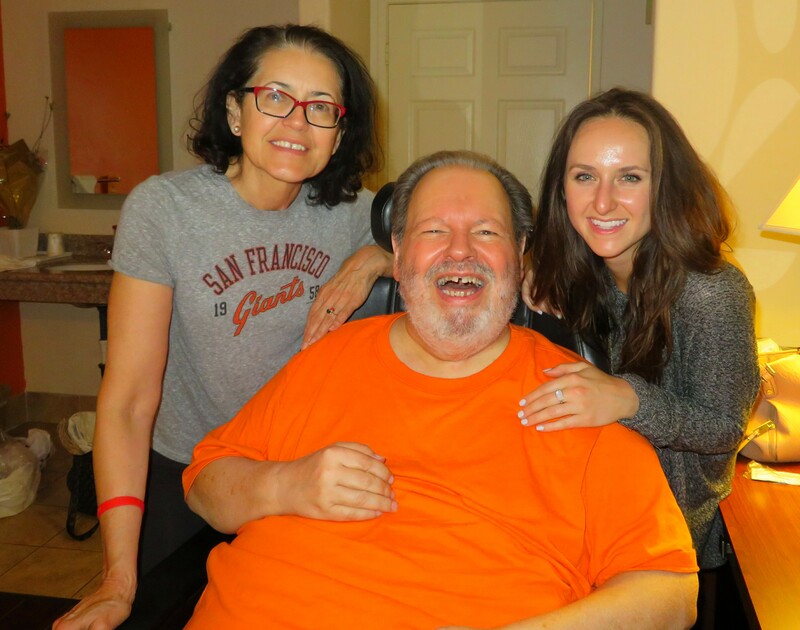 My beautiful wife Liz and the equally beautiful dear friend Sherri Miller worked extremely hard to take care of all the complicated needs of this ALS patient! If I live to 120 I could never thank them often enough! Let me offer this inadequate … THANK YOU LADIES FROM THE BOTTOM OF MY HEART!! 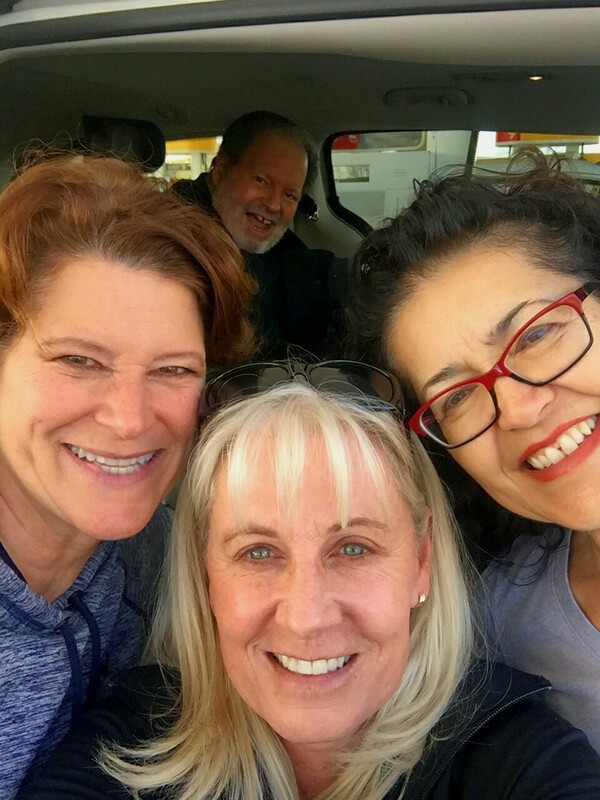 We began our adventure in our new wheelchair accessible van by making our longest drive of the trip to Las Vegas. My dear cousin Brenda got us a great deal on two rooms at the luxurious MGM Signature Towers. 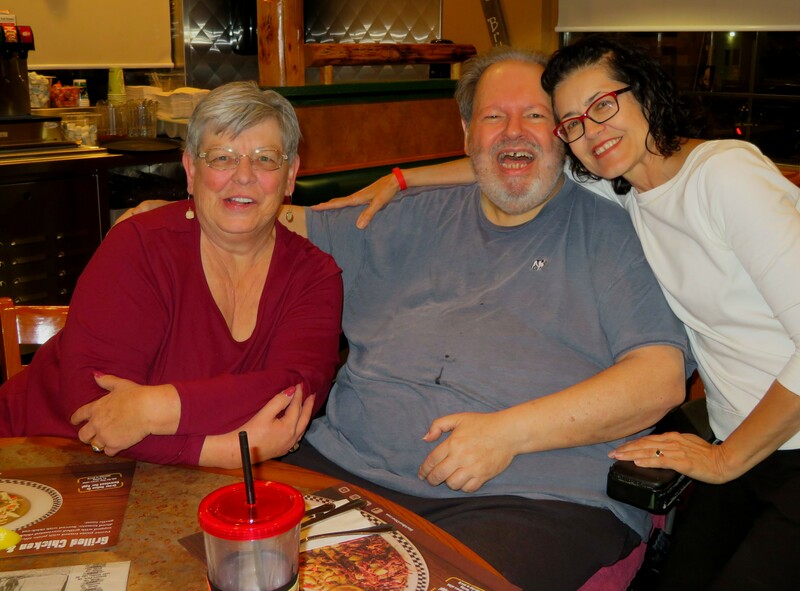 While there for two nights I reconnected with my cousin Nancy, Brenda’s mother. It was very special to see Nancy after a 23 year interval. On Friday after two nights in Sin City we departed for Scottsdale. While shorter than our first leg, it was a difficult drive on less than ideal roads. 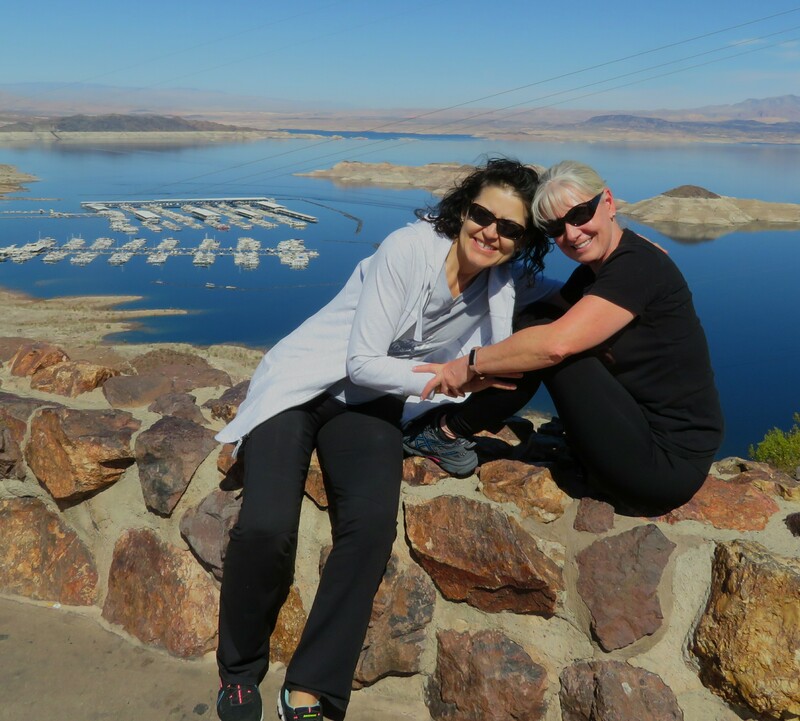 On Arizona highway 93 we were amazed by seeing nothing but cacti and parched desert for over a hundred miles! I kid you not, there was nothing on that stretch of desert highway … not even a Starbucks! It was so desolate that one of our intrepid lady drivers, whose identity will be withheld, had to use the desert to pee. Eventually we made it to the luxury Hilton Resort & Villas. The two bedroom villa that Lizzy had booked was PERFECT! On arrival we were delighted and surprised to find a gift basket waiting for us! 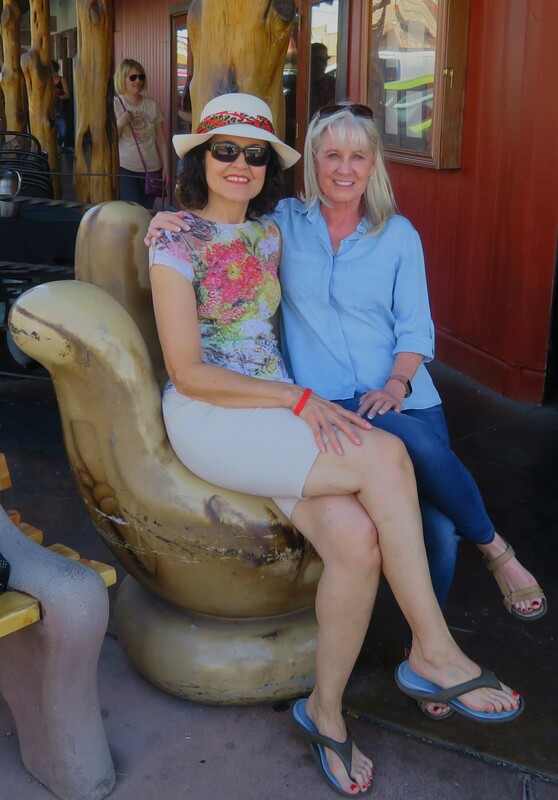 After unsuccessfully trying to guess who had sent it, we again were delighted when we discovered the basket had been sent by my high school classmate Darnel Doty, who I planned to see on this trip after 47 years, and her husband Ron. 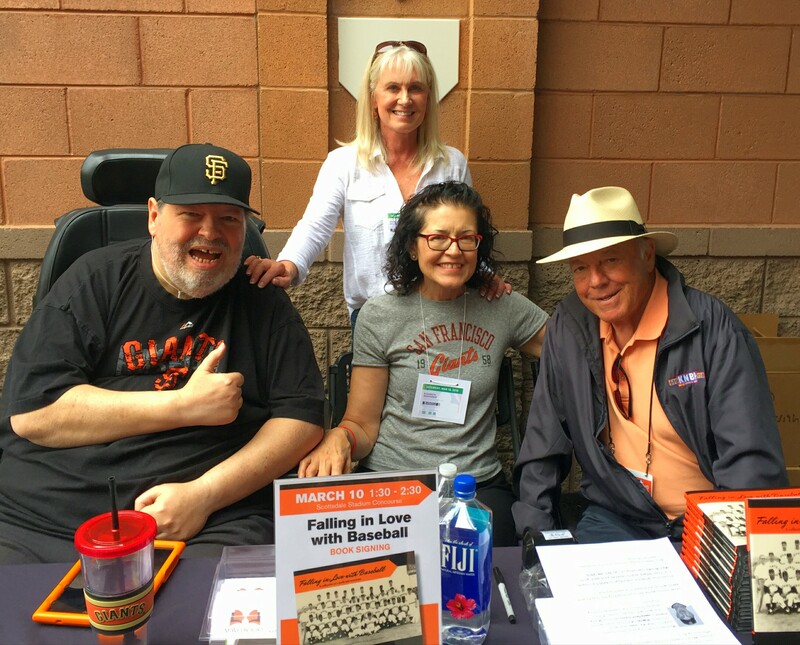 The following day was Saturday and time for our book signing at Scottsdale Stadium. 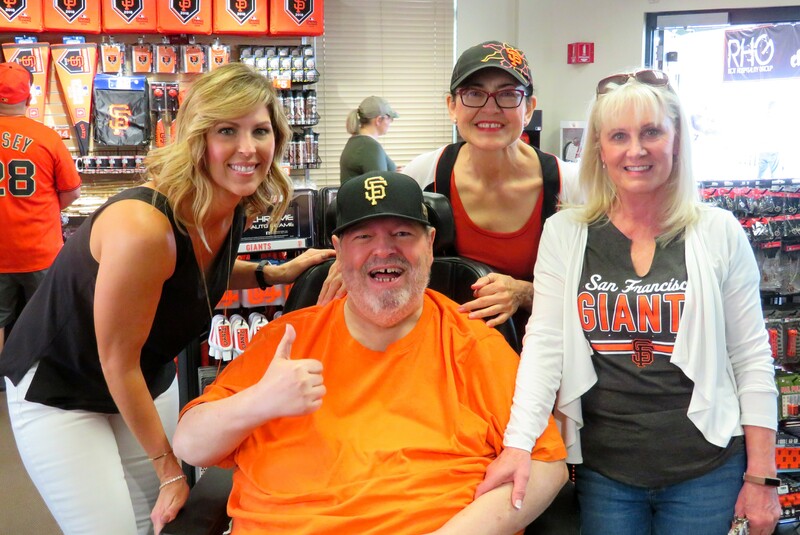 The lovely Lauren Porter from the Giants handled our needs flawlessly and the book signing was a rousing success! 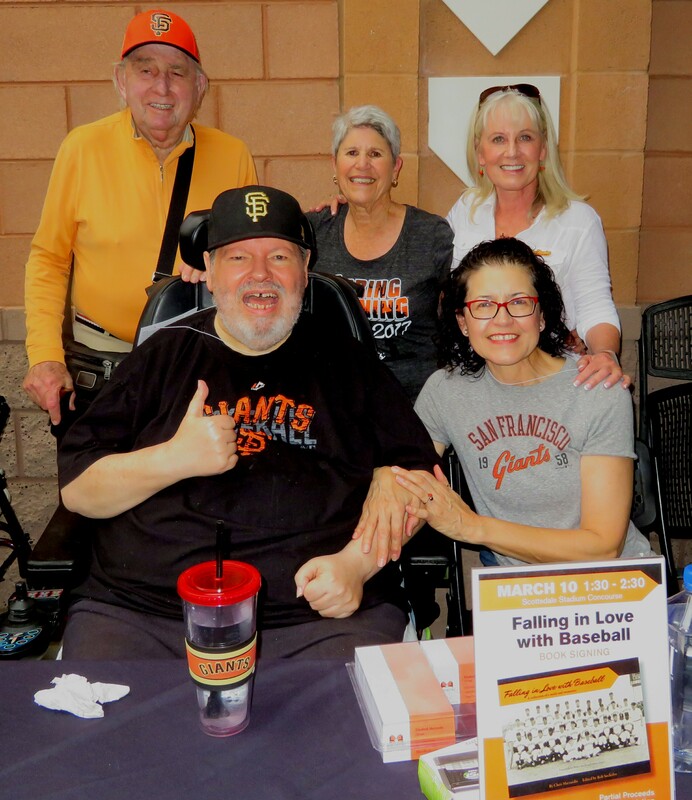 We were assisted by my editor of the book Bob Sockolov, KNBR Marty Lurie who wrote one of the forewords in my book and the lovely talented designer of the book Jill Sockolov. We sold 44 books which Lauren said was excellent. 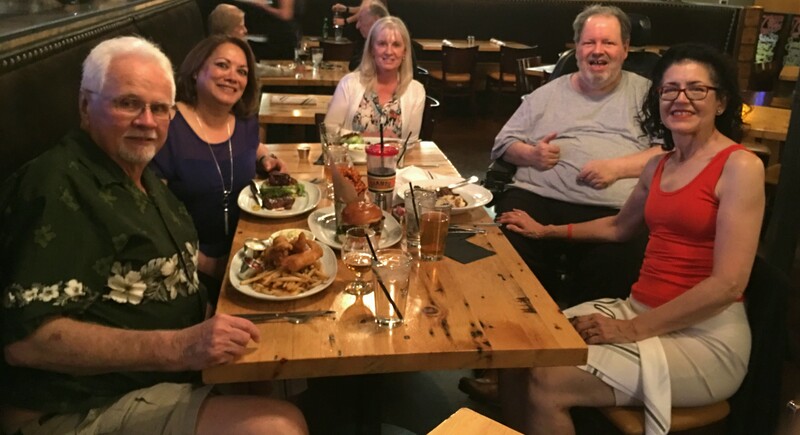 That evening we visited with our dear friends and sisters Clem and Bernadine Sklodowski who live in Scottsdale. It was nice seeing them AND catching up. 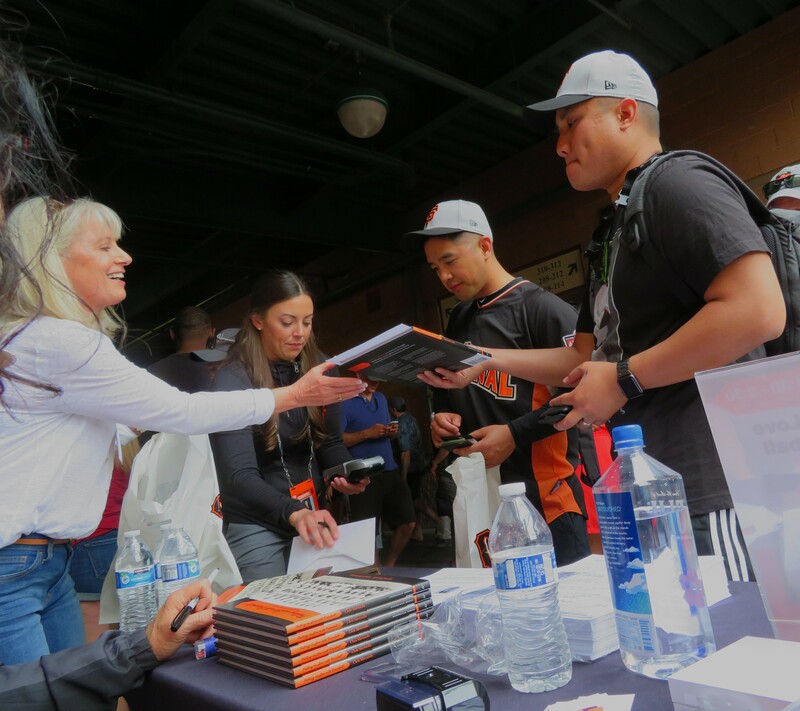 On Sunday we went to Scottsdale Stadium early to catch a book signing by NBCSBA’s Amy Gutierrez. 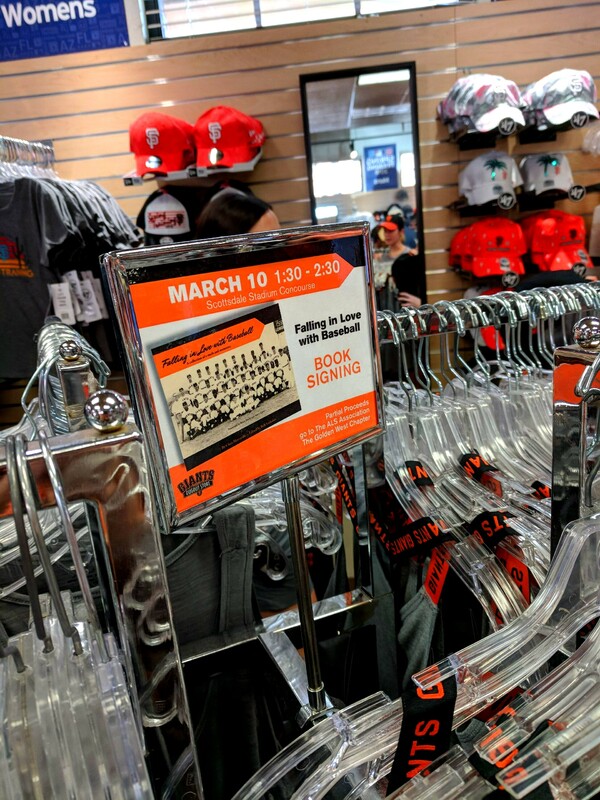 I didn’t realize the game that day began at 3 PM and we has to wait for over an hour for the gates to open after going to Amy G’s book signing. Lizzy, Sherri and I had the second level patio area virtually to ourselves as we enjoyed the perfect weather and the game. 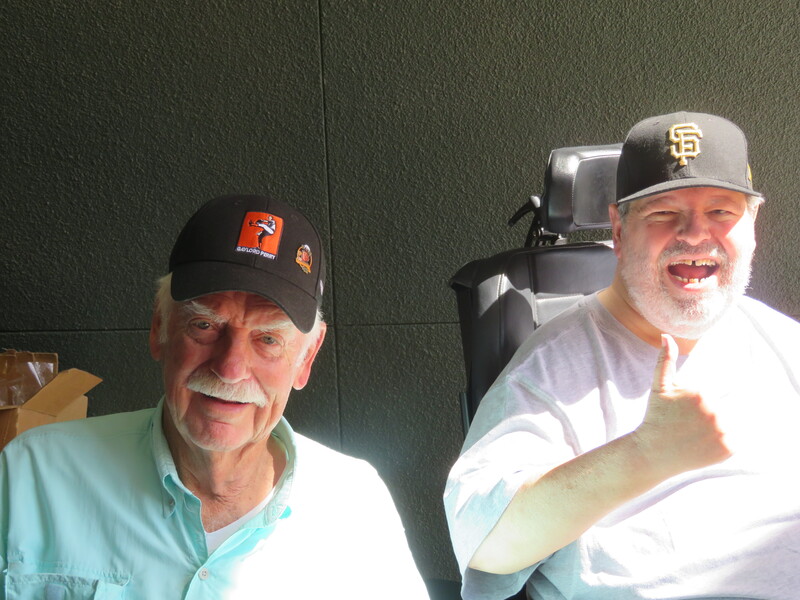 Before the game I got access to the press box and radio/TV booths to briefly visit Marty Lurie, who was on the air, and Mike Krukow and Jon Miller, who were preparing for their NBCSBA TV broadcast. 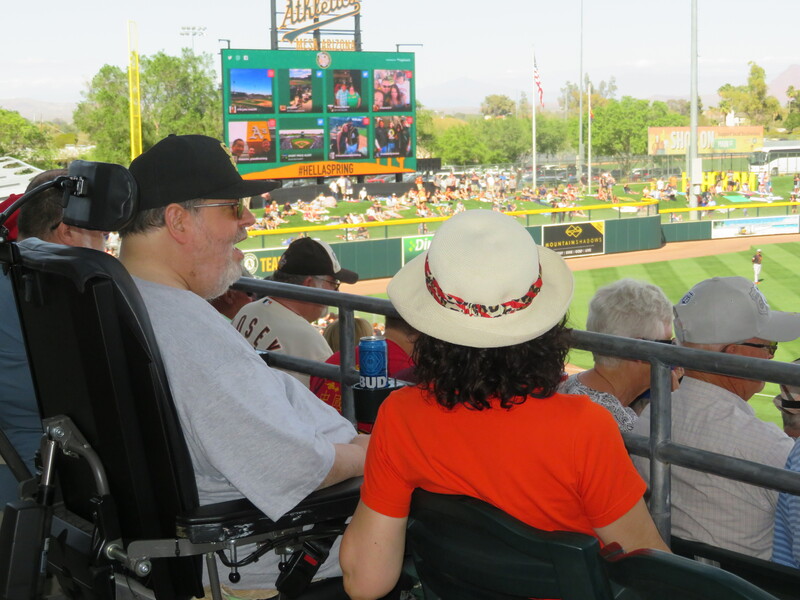 On Monday we went to the A’s Hohokam Stadium, the Cubbies spring training home for years, in Mesa to see the Giants take on the A’s. Early in the game an announcement came over the p.a. between innings that to go to the Ferguson Jenkins table to get an autograph. Thinking Hall of Famer Fergie Jenkins was there I asked Lizzy to take me down there for an autograph. When we emerged from the elevator I was flabbergasted by who was sitting at the table. It wasn’t Ferguson Jenkins! Instead it was five of my favorite former players! 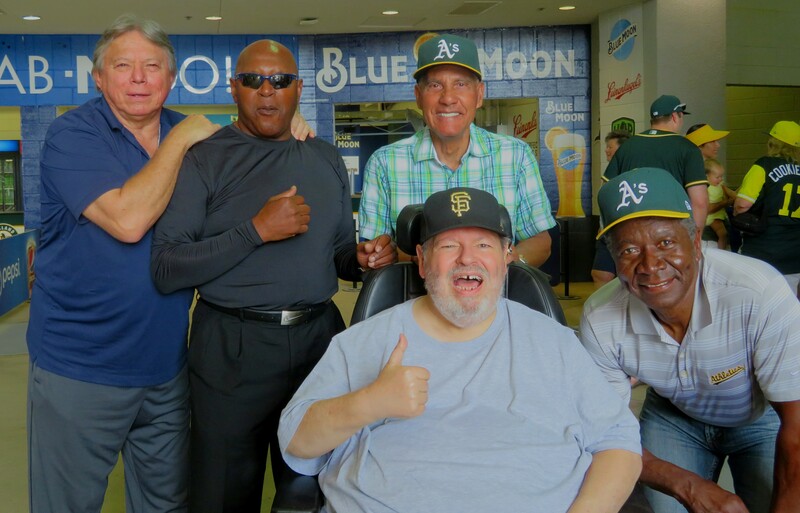 There was John “Blue Moon” Odom and Bert Campaneris from those outstanding three-in-a-row champion A’s, Vida Blue also from those great A’s teams of the 70’s and the Giants, Giants All Star Darrell Evans and … Giants Hall of Famer Gaylord Perry one of my idols from the 1960’s Giants teams! 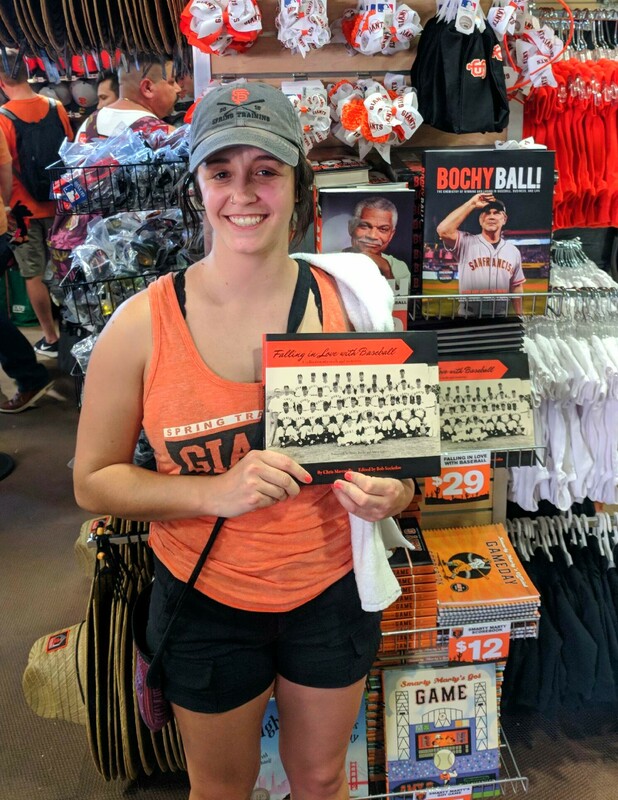 I bought a ball signed by all of them and got photos with them! 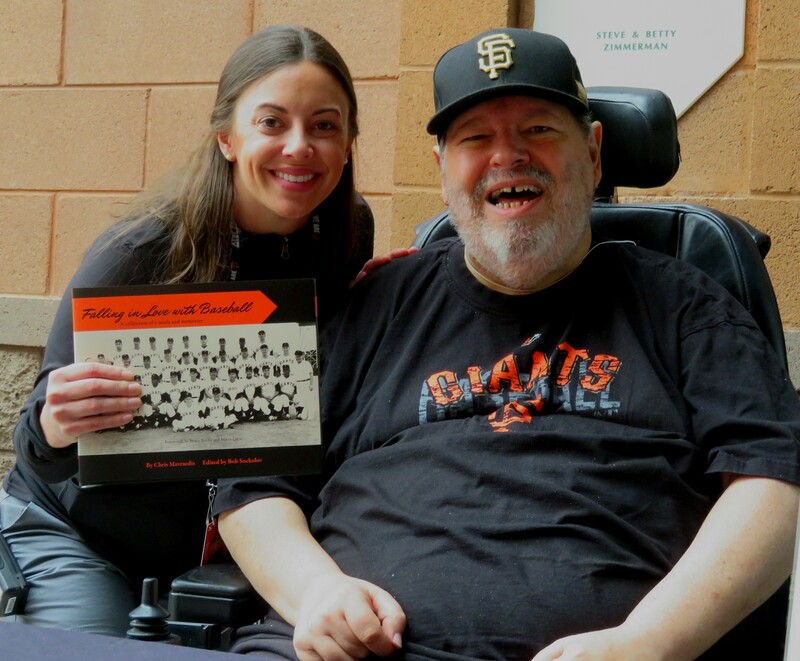 What a thrill for me, a lifelong baseball fanatic! 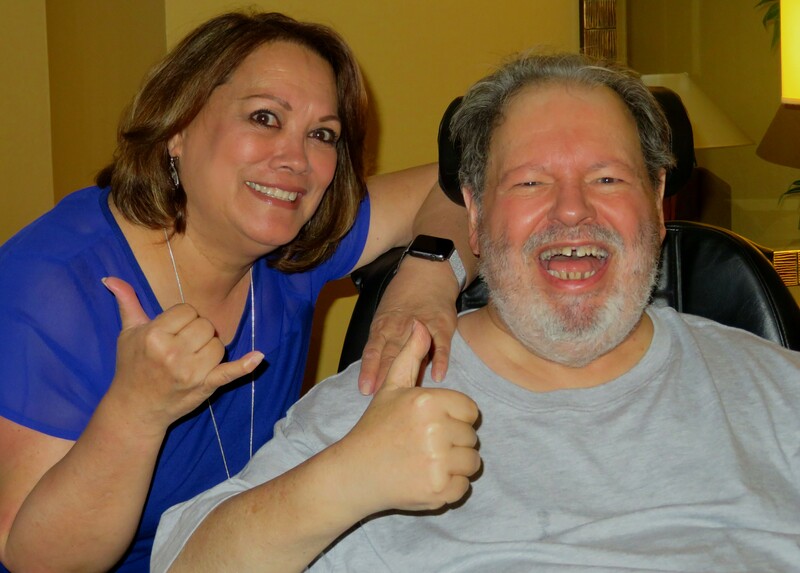 That evening I got to reconnect with my old Irvington High classmate Darnel Keko’olani, now Doty and meet her husband of 44 years Ron. Darnel and I hadn’t seen each other since we graduated high school in 1971 … 47 years ago! It was a very enjoyable dinner and evening. Tuesday was unfortunately departure day! Our destination was Pasadena in order to break the long trip home in two. The drive was uneventful, but on arrival at the Pasadena Inn things got, shall we say, interesting. The hotel completely messed up our reservation! Liz had called to make sure there was room under the bed to slide my lift under to transfer me from wheelchair to bed and vice versa. Instead she was shocked and angered by seeing the bed was on a platform with no way to get a lift under! We had a problem! To complicate matters I had given the address of the hotel to one of my former nurse’s, Jessica, who now works at UCLA Medical Center. After a tense and frustrating two hours we still hadn’t found a new hotel. It seemed that the whole town of Pasadena was booked. As a last resort Liz called a Howard Johnson that was close by. They seemed to have a room that met our needs. Jessica followed us the two miles to the HoJo’s. Surprisingly the room was PERFECT! In fact, it had the best bed I slept on of the three hotels. Who would’ve imagined that HoJo’s would have the best bed of the trip! Jessica had brought Liz a nice bouquet of spring flowers. After an improvised dinner of take-out eaten on the bed and a nice reunion with the beautiful Jessica it was lights out. Our most challenging day of the trip was over. The following morning we got a late start due to my toilet needs. 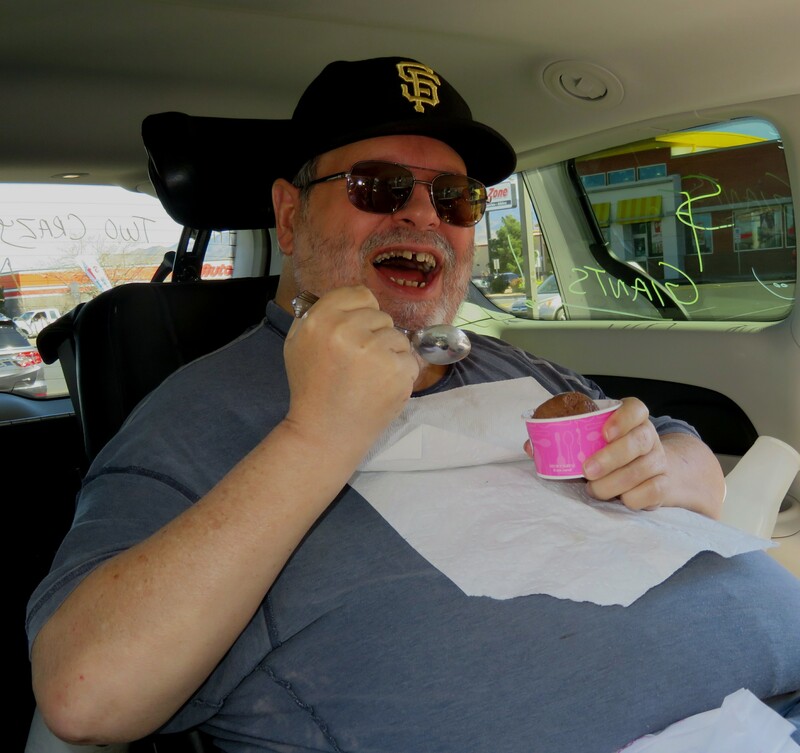 Traveling is challenging when you’re disabled! We almost had to stay an extra night. The drive home to San Francisco was uneventful other than a few showers we passed thru on interstate 5. During the drive we counted six beautiful rainbows! It was the perfect ending to a great trip! 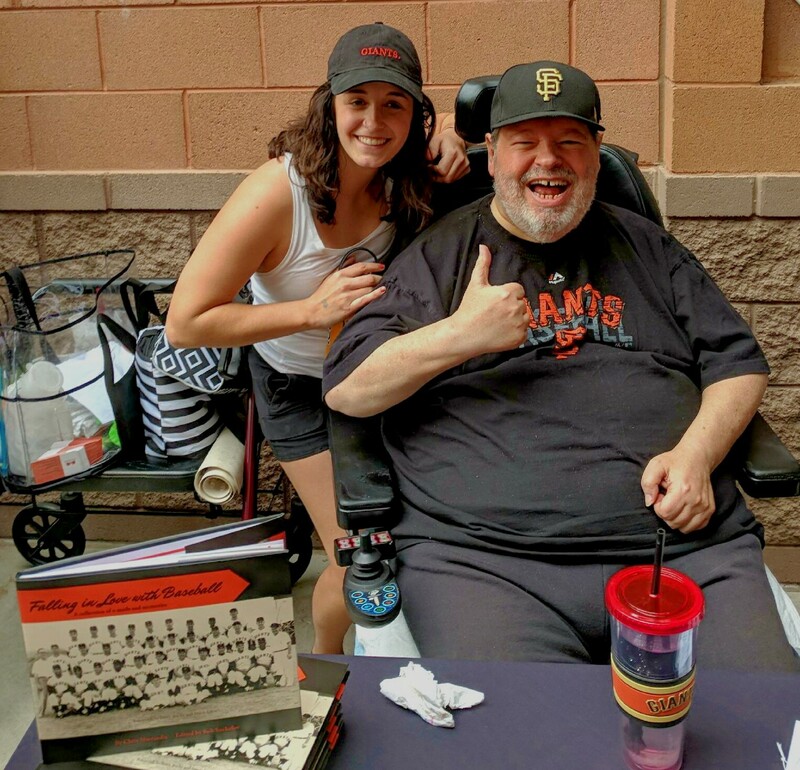 ← Special ALS Fundraising Event on April 25th After the Giants Game! I love the pictures! Looks like everyone managed to have fun! p.s And we LOVED the back window message that punctuated your travels.